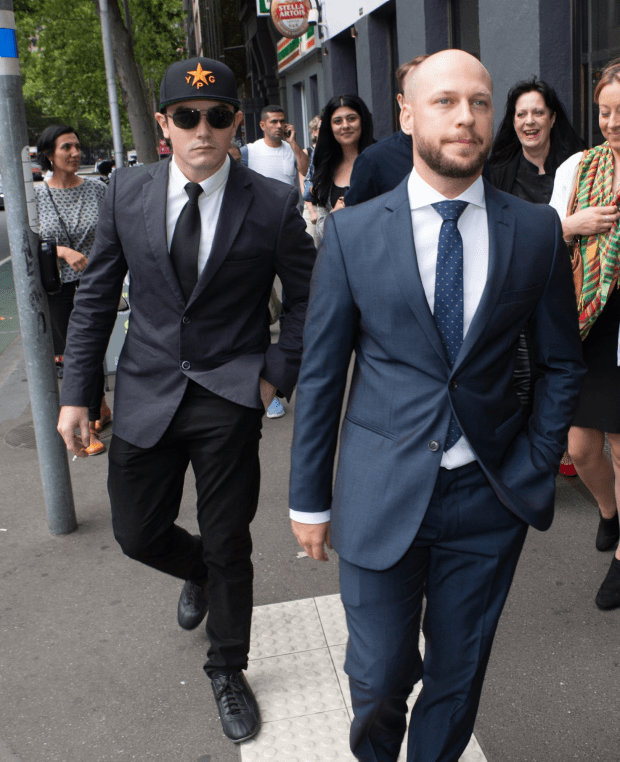 9 Feb – Federal prosecutors have dropped a criminal case against a Melbourne man who was accused of trying to fight in the Middle East against Islamic State. Jamie Reece Williams, 29, had been charged with a single count of engaging in conduct to prepare to enter a foreign country with the intention of engaging in hostile activity, following his arrest by anti-terrorism police in late 2014. But in a decision that will likely have ramifications for the Australians who have been investigated for engaging in the fight against Islamic State, and those who want to travel to the Middle East to do so, a federal prosecutor told Melbourne Magistrates Court on Tuesday the charge against Mr Williams would be withdrawn. 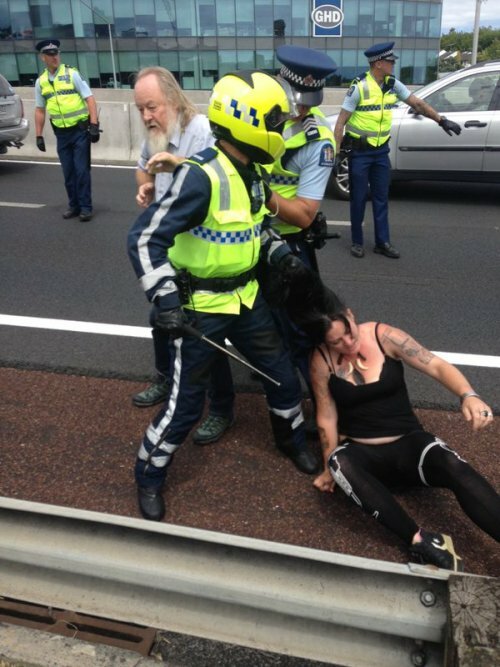 11 Feb – Two protesters who suspended themselves from a Melbourne bridge with a banner imploring the federal government to let asylum seekers facing deportation stay in Australia are back on the ground. Katherine Woskett, 25, and Hannah Patchett, 22, began their protest on the Yarra Bend Road overpass on the Eastern Freeway alongside a “let them stay” banner at 7.30am on Thursday. They want to stop the imminent deportation of 267 asylum seekers, including 37 babies, from Australia to Nauru. A High Court decision on February 3 cleared the way for their return following a failed challenge against Australia’s offshore processing arrangements. Ms Woskett and Ms Patchett’s protest ended after about three hours when they came down on their own accord and spoke to waiting police officers, who confiscated their banner. “The pair left pending further inquiries,” a Victoria Police spokeswoman told journalists. It’s unclear if the women will be charged but police have told them to expect a summons in the mail. The pair had widespread support on social media, as well as from asylum seekers in detention. “All day we have been receiving messages from refugees who are actually in detention centres,” said protest spokeswoman Helen War. 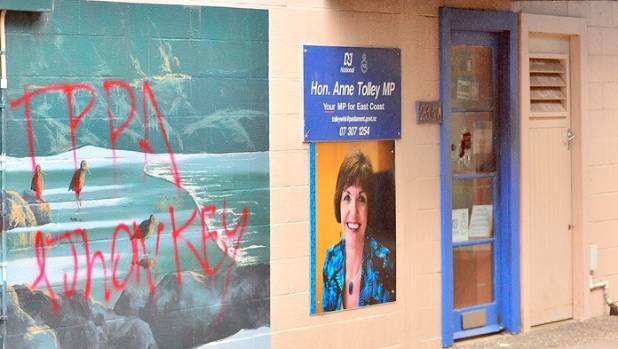 5 Feb – Molotov cocktails were thrown into Government minister Anne Tolley’s Whakatane office overnight and anti-TPPA graffiti was scrawled on a wall outside. Tolley said she hadn’t expected any attacks on her office, with anti-TPPA marches in her electorate run in a “well-organised and well-contained” manner. The office would be closed over the weekend while police finished their work and damage was dealt with, Tolley said. In a statement, Prime Minister John Key said he was disappointed by the attack. “People always have the right to peaceful protest and are free to do so, as long as they don’t break the law or put anyone in harm’s way. The fire appeared to have happened overnight but had been reported to police soon after 7am, said Senior Sergeant Denton Grimes of the Bay of Plenty District Command Centre. 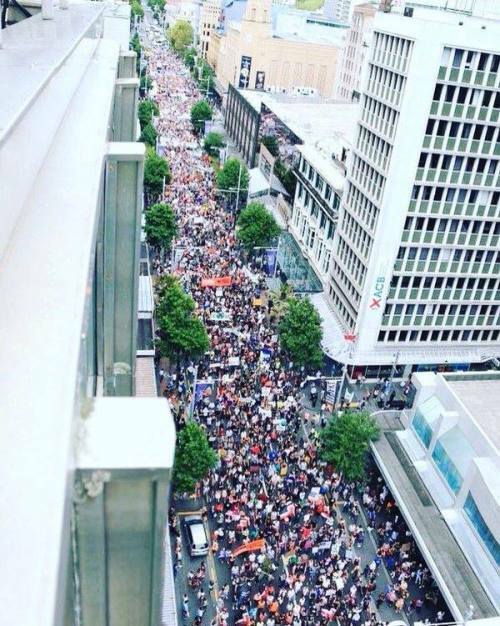 5 Feb – The Trans Pacific Partnership Agreement was signed at Sky City in Auckland this morning, amid large protests in the central city. Detective Superintendent Richard Chambers has spoken about the large police operation in central Auckland. He said there were no arrests made and several hundred officers were involved in the operation. He is aware of images circulating of police being “heavy handed” (aka pulling protesters by their hair, throwing them on the ground, and beating them with batons and fists, twisting arms and choking protesters with illegal holds.) but says he is confident they operated appropriately to stop people from running onto on-ramps and putting themselves at risk. “There have been thousands of people in the city, many of those people were there to voice their thoughts on TPP,” he said. He says officers were abused, had their clothing and hats pulled, but displayed “outstanding professionalism”. 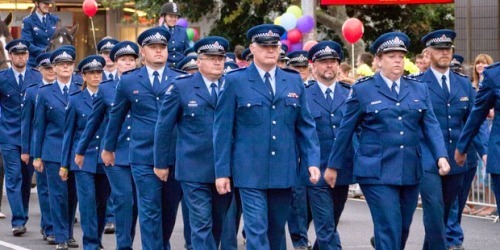 A massive group of protesters had gathered at the intersections of Victoria West St and Hobson St, while a steady stream of protesters also made their way down Nelson Street, parallel to Hobson Street, while chanting profanities directed at police. 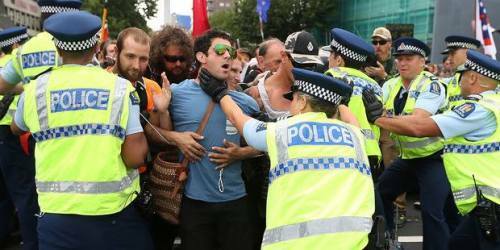 A large number of people from several iwi groups had gathered at Victoria Park, and later boarded buses heading for Waitangi. “The world is watching the hikoi today, whanau,” one of them said. Angry vendors went on a rampage Wednesday when officers arrived to seize counterfeit products being sold in Sa Kaeo province near the border with Cambodia. 3 Feb — Police are licking their wounds after an enraged mob of vendors chased them away when they tried to seize fake goods at a market near the Cambodian border. Twelve officers were injured Wednesday when police and French Embassy observers went to the Rong Kluea market at Aranyaprathet in Sa Kaeo province to seize items such as fake perfume that violate intellectual property law, according to the Department of Special Investigation. A DSI statement said about 400 Cambodian laborers surrounded the officers, pelted them with rocks and bottles and pushed over a police pickup truck. It said the police were withdrawn to ease tensions.